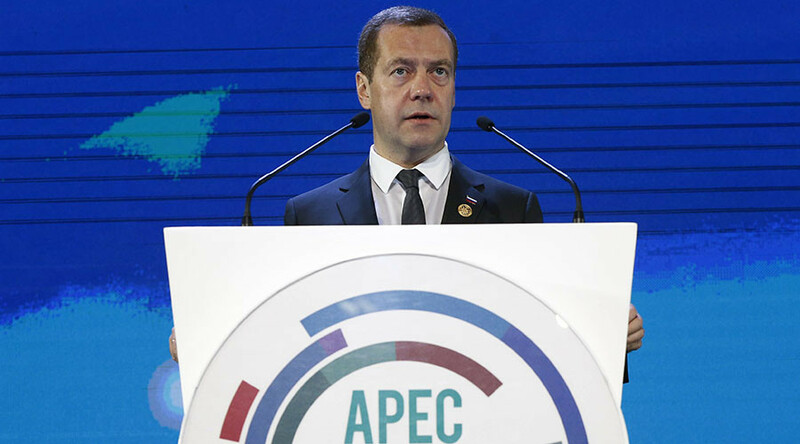 The Russian economy and the financial sector are quite stable despite falling oil prices, a weaker ruble and sanction’s pressure, said Russian Prime Minister Dmitry Medvedev at the Asia-Pacific Economic Cooperation (APEC) Summit on Wednesday. Russia is currently going through a difficult period, but despite all the problems, the country is coping with negative price fluctuations and is maintaining investor interest, according to Medvedev. “The weakening of the ruble allows foreign investors to buy Russian assets at lower prices, and many take advantage of this,” the Prime Minister told summit delegates. Medvedev said the volume of direct investment into the Russian economy from the Asia-Pacific region was worth about $10 billion. The countries from the area are working to increase investment, actively establishing funds, he said, adding that they already exist in China and Korea. During the summit, Russia and the Philippines signed an economic cooperation agreement, under which a joint commission for trade and economic cooperation will be set up. The Asia-Pacific Economic Cooperation (APEC) summit is taking place in the Philippines capital Manila.